A SIMPLE box is making a world of difference to students who might have been forced to skip school in the past – simply because of their periods. 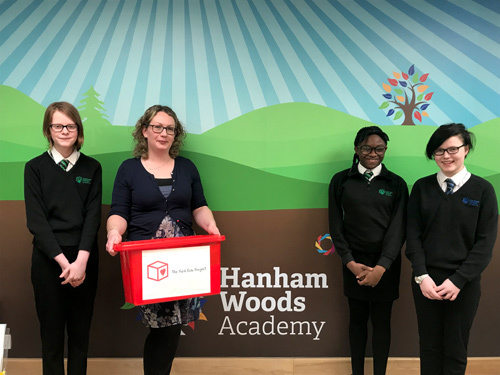 Nine schools, including Hanham Woods and John Cabot academies, are being supplied with boxes filled with sanitary products and new underwear thanks to the Red Box Project Keynsham. Jackie Sheehan, from Keynsham, who coordinates the project with neighbour Vicki Why, said it came as a shock to learn that “period poverty” – where girls and women can’t afford to buy essential sanitary products – was a reality for local youngsters. Jackie is now looking for a coordinator to expand the project in and around Hanham and Kingswood. Girls’ rights charity Plan International UK carried out research in 2017 that found one in 10 girls had been unable to afford sanitary products while 12 per cent had had to improvise sanitary wear because of the cost. The Red Box Project was launched in Portsmouth in the same year by three friends, who contacted schools to ask if they would like a constantly stocked box of sanitary products after reading about period poverty. Two years later, there are now 2,718 boxes stocked with free sanitary care around the country, provided by 241 projects. Jackie, who works for an accountancy firm, launched the project in July last year, funding the first box herself before setting up collection points for donated items at shops and other locations around the town, and said the support she has received has been testament to the kindness within the community. Schools are given posters to display in bathrooms and in staff rooms to let pupils and staff know the boxes are available, with some going a step further and even giving assemblies on the issue, Jackie said.